THE HURRY UPS STAY LIT OUTSIDE OF MULTIBALL. I REPEAT: THE HURRY UPS STAY LIT OUTSIDE OF MULTIBALL. THEY’RE IN THE BACKGROUND BUT COUNT. WE HAVE A CATEGORY 5 BUG. I just don’t wanna be forced to keep playing Spot once I get the super jackpot. That’s all. It doesn’t seem to be a bad mode for a single ball mode; long timer, can score well (especially level 2/3). Yeah but 95% of the time I start it I either have Raven or Munster Madness ready. Until they fix it, qualify Grandpa, start Spot, then start Grandpa. Gets all your awkward modes out in one go! BUG: If Munster Madness is ready at the start of the ball, skills shots are not available. These are ordinary progress shots of a basic mode. And a shot returning the ball in open play. Yet the game is throwing an extended length light show. First involving all indicator lights. And after this all GI lights. I don’t get it. Sorry. Why do this? What is left to make the super duper jackpot special. What is left to fanfare that the mode is completed. If balls are in play - hands off the GI. Maybe have the “zap” button deliver an electric shock if you hit it when it’s not flashing. Based on the lighting conditions where I’ve played it, that’s what I’m often prone to do. I’d like it if the action button was unlit when it’s not available for anything. The difference between solid blue and flashing blue isn’t readily apparent in my peripheral vision. Also I feel like casual players might just smack it because it’s lit… for nothing. I know there’s a thread about the Snikt shot in Deadpool being a silly playfield X target given it’s seeming randomness, but I’ve had a ball from the pop bumper closest to Kitty bounce back and forth into the target awarding all the lit Xs available a few different times now. This seems much more random than Deadpool to me. I would expect a rule that disables the Kitty target for a bit if the last switch hit was a pop bumper—like many other games do when there’s a scoop from a pop nest that may award modes, mysteries, EBs etc. Animations are extremely long in the game, allowing exploits in the Spike 2 era to be heavily leveraged in play. I would expect a rule that disables the Kitty target for a bit if the last switch hit was a pop bumper—like many other games do when there’s a scoop from a pop nest that may award modes, mysteries, EBs etc. But please, only if in single ball play. The last thing you want is a valid shot to Kitty not counting because there is another ball in the pops! I think I had the Munster Madness bug today. 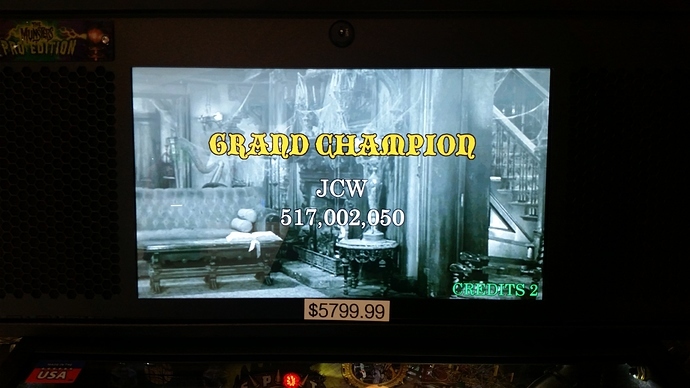 Ended up with a 425M Munster Madness which was more than 80% of my total score. Very nice !! 475 million to go for me to match it !! What’s the…like photoshopped $5799.99 ?? It’s not photoshopped. It’s at a retail store and that’s what they are asking for it. Thx…and even if it is a bug-crazy to see that high of a score. Those ~100 mil Hurry Ups in Munster Madness really are a bummer for tournament play. Hope the bug is resolved soon! Munster Madness 2 hurry ups do not end at the end of Munster Madness. Spike 2 related timing issues, notably multipliers timing out during long animations (like MM start) and add a balls.